How do I add, edit, or remove a CSI division/trade code? The list of CSI Trade Divisions is custom to your company. 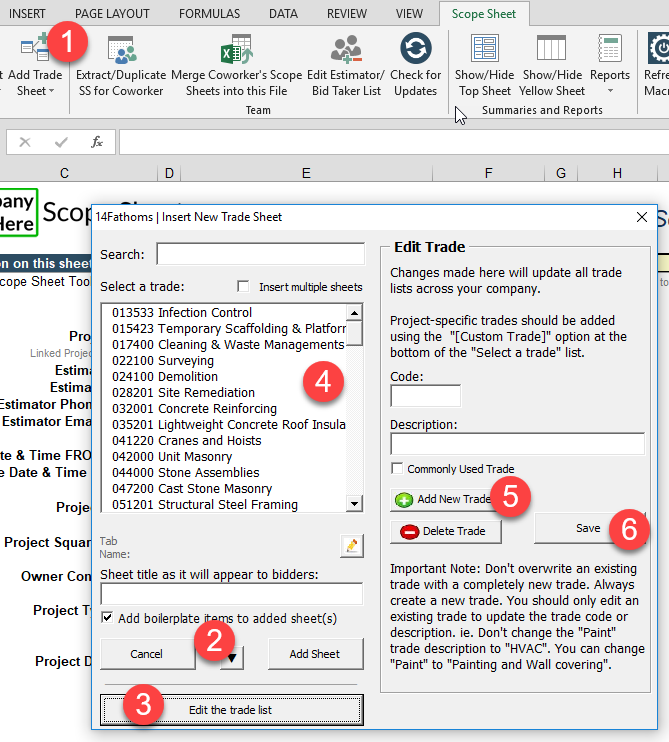 You can add, edit, or remove CSI trade divisions within the Scope Sheet file. NOTE: If your company only allows editing CSIs while in Master Scope Sheet template mode, please enter that mode and then return to this FAQ. Click “Add Trade Sheet” from the Scope Sheet toolbar. Click the down arrow at the bottom. Click “Edit the trade list” button. Select an existing CSI to edit it. Please read the important note about editing an exiting CSI trade. Create a completely new CSI or delete an existing one by clicking the appropriate button. The edits made will be reflected on all existing and new scope sheets. If your company uses the bid list, the changes will be reflected there as well. ← How do I use a past project bid list for a new project (import a previous bid list)?